Superbly curated content, Volume 25 of THE ADDRESS Magazine showcases some of the world’s most beautiful homes for sale, inspirational travel and lifestyle related content. Its 602 oversized, glossy pages are filled with a carefully edited selection of luxury real estate and luxury homes for sale in some of the most desirable luxury property markets in the world. From ultra-exclusive resort vacation homes on exotics islands to prestige country homes in areas of outstanding beauty; from fine city living in a prized address to perfect weekend getaways and beach houses, browse THE ADDRESS Magazine and discover a range of luxury properties, from elegant apartments to extravagant family homes for sale throughout the world. With a focus on everything that makes travelling spectacular – food, chefs, culture and more – Food & Travel belongs on the must-read list of any travel enthusiast and foodie. Moreover, our Curated section has the top picks when it comes to fine living and well-being; from new discoveries to classic favourites. Do not miss our ultra-modern villa for sale in Phuket, which is a visionary masterpiece. Showstoppingly beautiful, it is a veritable visual tour de force with plenty of wow factor. The extraordinary villa is supremely contemporary and strikingly stunning with its intelligent geometry and sculptural magnificence. A marvel of design and construction – that will both amaze and edify – the contemporary villa is so beautiful, so faultless and so unique. For buyers seeking a trophy asset in Italy, do not miss our ultra-exclusive palace property for sale near Florence is an immensely impressive historical gem. Rich in architectural beauty and irreplaceable in location, international in prestige due to its highly prized address, the one-of-a-kind masterpiece is one of Tuscany’s – and indeed Italy’s – finest properties to own. When getting away from it all is the goal, a tropical island home is the quintessential destination. The private villas for sale in Zil Pasyon Seychelles should fit every beatific bill, while providing no shortage of sea, sun and blissful escapism. The magnetic appeal of owning an indulgent tropical vacation home here will be irresistible, with its picture-perfect beauty and immense style. Epitomising sheer barefoot luxury, these Seychelles properties for sale offers the opportunity to buy your own slice of paradise in the Indian Ocean. The piece de resistance of Phuket luxury real estate market may be our mega mansion extraordinaire for sale, which is located on the island’s famed West Coast. Representing the ultimate in coastal luxury, this prestige property for sale in Phuket features magnificent scale, indulgent spaces, lavishly designed interiors, outdoor extravaganza and sweeping views. This is the perfect home for multi-generational living and for entertaining family & friends. Buying property in Algarve qualifies not only as a top lifestyle option in Europe, but, in fact, as one of the world’s best places to live or retire. With unspoilt beaches, authentic fishing villages, world-class golfing and great dining, Algarve is the perfect place to enjoy a carefree ambience and a laid-back lifestyle. Add lovely climate and superb accessibility, and it is easy to see why Algarve property is so popular with lifestyle investors. 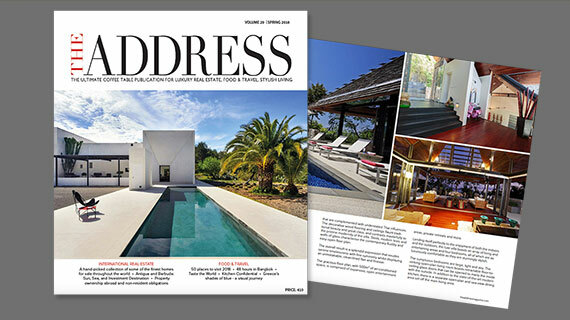 This issue of THE ADDRESS Magazine features a high quality selection of luxury Algarve holiday homes for sale including an immensely elegant Algarve golf property for sale, a stylish penthouse apartment for sale in West Algarve, a contemporary house with stunning views for sale in Lagos, Algarve, and a contemporary off-plan property with sea views for sale in Carvoeiro, Algarve. The North of Italy is scattered with picturesque lakes surrounded by snow-capped mountains, the largest being Lake Garda, Lake Maggiore and Lake Como. And those classic lakes images of flower-bedecked balconies, Baroque gardens and magnificent waterside villas can be found here in abundance. With their beguiling mix of sophistication and timeless charm earning them enduring appeal, luxury real estate in the northern Italian lakes is adored by generations of discerning investors. This issue of THE ADDRESS Magazine features a splendid collection of Italian Lakes properties for sale such as a traditional stone farmhouse for sale in Angera Lake Maggiore, a luxury apartment in a beautifully restored villa for sale on Lake Maggiore, a fine Stresa apartment for sale, and an attractive property for sale on Lake Orta, Piedmont. Whether you are looking for a second home as a base for regular holidays or as an investment to provide steady rental income, buying a vacation home in France remains a firm favourite amongst international lifestyle investors. Our world-class, character-filled homes for sale in the heart of France’s delightful Lake District provide luxurious and hassle-free vacation home ownership. Properties for sale in Limousin at Wyndham Halcyon Retreat offers the opportunity to invest in real estate in the heart of the French countryside with its unspoilt charm and timeless allure. Dreaming of buying a property in the South of France where a slower pace of life and beauty spots await, do not miss a unique chance to own a piece of prime Languedoc real estate. The new villas for sale in South of France offer a select few the chance to buy into the enviable lifestyle of this region. Madrid is a modern and cosmopolitan city, with an ancient history and impressive artistic wealth. With its high standard of living, world-class gastronomy, stunning architecture, and fantastic cultural and sporting legacies, Madrid an understandable choice of location to start a new life in Spain. THE ADDRESS Magazine showcases some luxury Madrid properties for sale including an exclusive mansion house for sale Madrid Prado Largo Pozuelo de Alarcon, a luxury penthouse apartment for sale in the Salamanca district, a fine duplex apartment for sale in Nueva España, Chamartín, and a prestige apartment for sale in Chamberí district. Phuket real estate is unquestionably Asia’s most sought after high-end lifestyle destinations catering directly to a select group of vacation home buyers from around the globe. Each of our selected Phuket property for sale offers the opportunity to enjoy the tropical island in the utmost luxury through residential ownership. In this issue, we have a wonderful collection of fine properties for sale in Phuket, such as a magnificent beachfront villa for sale on Natai Beach, a dazzling Kamala property for sale on Phuket’s cosmopolitan West Coast, a luxury Phuket East Coast villa for sale with stunning sea views, and a beautiful absolute beachfront villa for sale in Phuket. With astonishing natural beauty, a rich cultural heritage and a balmy climate, many lifestyle buyers are looking to pursue that Tuscan property dream. THE ADDRESS Magazine features a stunning selection of luxury Tuscany homes for sale including a prestigious Tuscan castle for sale in Chianti, an exceptional Renaissance-style mansion property for sale outside Florence, an elegant apartment for sale in the historic centre of Siena, and a Chianti medieval castle and vineyard for sale in Tuscany. For travel inspiration and insider tips, do not miss THE ADDRESS Food & Travel section. Italy counts 51 UNESCO World Heritage Sites within its borders, the most of any country on the World Heritage List, which is a testament to the natural beauty and cultural richness of the nation. Be inspired and take a journey like through a fascinating collection of our selected Top 25 UNESCO World Heritage Sites in Italy. Our photo essay "Indonesia – A Place of Extreme Scenic Beauty", with its stunning visual narration, embarks on a journey of discovery through a kaleidoscope of spectacular scenery, beautiful beaches and fascinating temples. For your passport to stylish discoveries, do not miss some of our top vacation home rentals in Europe in this issue. Specialising in unique vacation homes, THE GREAT ADDRESS handpicks holiday home rentals and small hotels that are truly original and special. You can find a preview in THE ADDRESS Magazine of some of the holiday homes to rent that we have selected in the Aquitaine, French Riviera, Provence and Loire. As 2016 draws to a close, THE ADDRESS Magazine is already looking ahead well into next year – the food and restaurant scene moves fast and we want to stay ahead of the game. In this issue, some of the UK’s most influential foodies predicts 2017 food trends that are worth your attention. The foodie inspired luxury lifestyle publication features in each issue profiles and interviews with a leading chef, plus two signature recipes. Talented chef Aggi Sverrisson sits down with THE ADDRESS Magazine to talk about favourite ingredients, essential kitchen tool and much more. Curated is a section of the magazine dedicated to recent discoveries for stylish living, kitchen & dining, well-being and beauty. Enjoy the latest issue of THE ADDRESS Magazine, celebrating luxury homes and lifestyles around the world.